Many Westerners are concerned about the "Tibet Issue." It is said that the image of a mysterious, vague and ideal Eastern "Shangri-La" always lingers in their minds. Tibet is indeed as mysterious as anything you might have imagined about Shangri-La. The elegance and beauty of the snow-capped plateau, the uniqueness of its linguistic culture, and the canon of Tibetan Buddhism are all parts of human culture with special ethnic features which we cherish more than any other people. To protect the Tibetan culture, the Chinese government has spent heavily to renovate the Potala Palace, the Norbulingka and the Sakya Monastery. Unprecedented renovation of 22 temples and monasteries as well as ancient historical relics started early this year. The government has conducted a program of Collation and Study of Tibetan Sutra and brought over 100 Tibetan linguists to compile and collate different versions of Tibetan Sutra for publication. To protect the blue sky and clean water, the Chinese government will invest over 22 billion yuan ($3.19 billion) to build at least 160 projects until the middle of this century. The mountains, the rivers, the Tibetan Script Banners, and the names of the Buddha remain unchanged. Nevertheless, as Canadian scholar A. Tom Grunfeld writes in The Making of Modern Tibet, "Tibet is a land so wrapped in obscurity that almost any fantastic tales about it, or allegedly from it, are received with awe and believed, unquestioningly, by countless individuals in the world . Many call themselves 'experts' after reading a mere handful of texts, assuming that the uniformity of these accounts indicates their accuracy." The history clearly reveals that the old Tibet was not the Shangri-La that many imagine, but a society under a system of feudal serfdom. The serf owners, the political leaders and the heads of the temples, accounting for less than 5 percent of the total population of old Tibet, possessed almost 98 percent of the land and most of the livestock. And the Dalai Lama, was the largest and most powerful serf owner. The Sixteen Codes of the old Tibet stated, "the rebels and the subordinate acting against the supreme were those who committed severe crimes and they were to have their eyes gouged, to be hamstrung, to have their tongues cut out, to have their arms broken or to be killed immediately." In the old Tibet, both economy and culture was in terrible shape and the population did not even grow. Today, Tibet certainly needs to protect its unique Tibetan culture and the culture of Shangri-La, but definitely should not retain its brutality and backwardness. The protection of Tibetan culture has to go along with the development, progress, unity and happiness of the whole Tibetan population. Otherwise, it will become a living fossil, which has neither life nor vitality. The essential difference between the Dalai Lama and the Chinese government does not lie in the question whether there is a need to protect Tibetan culture, but lies in the question as to which side really cares for the essential interests of the Tibetan people. The continuation of Tibetan culture is possible only with the development of the economy and the improvement of living standards of the Tibetan people. It would be impossible for Tibetan culture to carry on if the living standards of Tibetan people declined even in the name of "preserving the particularities of ethnicity" or "protecting religious culture". It would be impossible for the Tibetan culture to carry on if the Tibetans returned to the so-called "holy Buddhist land" where "all people become monks", or if Tibet returned to the age of dark theocratic rule and the brutality of the feudal serf system. Today's Tibet has transformed itself, coming out from under a dark and cruel theocratic feudal serf system, and becoming a self-sufficient, progressive, just, equal and open society. In the old Tibet, life expectancy was 35.5 years, but now it has reached 67 years. This is the real "Shangri-La." During the 40 years from 1965 to 2005, the Chinese central government supported the local Tibetan government with about 97 billion yuan. Since 1993, the central government has offered transfer payments for Tibet which covers over 90 percent of the local governments' revenues. This has greatly supported the social and economic growth in Tibet. The annual growth rate of the economy in Tibet has exceeded 12 percent in seven consecutive years, which is much higher than the average growth rate of the whole nation. The rapid growth of the economy in Tibet benefits the protection of Tibetan Buddhism even more. There are now over 1,700 Tibetan Buddhist temples and nearly 50,000 monks. Sutra Banners and Mani Stone Mounds (Tibetan Buddhist Altars) are everywhere. Over a million Tibetans go on pilgrimages to the temples in Lhasa. The Tibetan scholars in China claim that the concepts of modernization have penetrated into the hearts of most of the Tibetan Buddhists, and many of them support developing some aspects of Tibetan Buddhism to make them relevant to modern society. Today's Tibet values and protects its own unique culture more than ever. This is the unchanging "Shangri-La". Today's Tibet tries its best to get rid of blindness and backwardness and runs towards its own happy and bright future. This is the changing "Shangri-La". The so-called "Tibet Issue" is always the meeting point of two issues. The first issue is that of sovereignty, which is to safeguard the unity of the nation and to oppose separatism, and the second issue is that of social reform, which leads to progress and a bright future and to oppose restoration of the old feudal system. Regarding the issue of sovereignty, the answer is clear. Any request or proposal regarding separation from China, even in disguised forms, should be abandoned and opposed. There is no way for Tibet to be independent, semi-independent or have any disguised form of independence. No country in the world supports the "independence of Tibet". For instance, during this year, the Dalai Lama made a speech at the British Parliament, deliberately talking about "the great and profound historical relationship between Tibet and England", and saying that "the United Kingdom has to carry out the mission of making history in terms of the Tibet issue". However, the British government soon after declared that it does not support the independence of Tibet. The Dalai Lama and his followers had to reluctantly announce to the public that they "do not ask for independence." Regarding the second issue of social reform, the answer seems complicated and confusing. On the surface, the Dalai Lama has claimed a "middle way" which is "not to look for independence but for autonomy"; in reality, he has pushed religion to its extreme, equated religion with ethnicity, and combined religion and politics. Doing so is no more than a way to indirectly seek the "independence of Tibet" at the cost of sacrificing the basic rights of the Tibetans and impeding the development of Tibet, and to cause Tibet to return to the theocratic serf system. Such a scheme wears a sacred halo, makes a pretext of "seeking the benefits of the Tibetans", makes up a legend about "Shangri-La", and is also disguised with many lovely concepts, such as democracy, human rights and religious liberty. Nevertheless, it is not difficult for the Westerners who understand the history of the darkness and despotism of theocracy in Western Europe during the medieval period to understand that this is far from what has been imaged as the "Shangri-La". Recently, their scheme was disguised under a legal packaging, by distorting the autonomous laws of the ethnic regions of China and releasing the "Memo for the Authentic Autonomy for All Tibetans" to drum for the so-called "real autonomy" of the "Tibetan Tibet". The ethnic majority scatters and the minorities gather, which is the basic situation for the 56 nationalities in China. All of the ethnic groups in China belong to a diverse and well-connected community, and form a "golden principle" of "three non-separations". The Han cannot be separated from the ethnic minorities and vice versa as well as the ethnic groups cannot be separated from one another. This principle has led to a reality that ethnic autonomy is closely related with regional autonomy. What are the true intentions of "real ethnic autonomy" with unrestrained "autonomy of a single ethnic group" so as to segregate other ethnicities from that area? What are the real motives of trying to combine into "a pure and larger Tibetan area" an "ethic group, religion and culture" at the cost of violating the "three non-separation" principle? What they really want is not Tibet's "autonomy", but the "suicide" of the Tibetans caused by ethnic segregation, ethnic antagonism, and separation. Has not the "Tibetan Youth Congress" clamored for "fighting for independence" through "suicides"? There is no way to separate Tibet from China, and no way for Tibet to return to the feudal serf system. Neither the tide of history, the Tibetan people nor the "holy land" of "Shangri-La"will allow it to happen. Only if Tibetans have a happy and prosperous life like other ethnic groups, can Tibet become what was described by the American author James Hilton in his novel, Lost Horizon, as "an everlasting peaceful land". 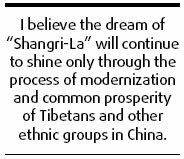 I believe the dream of "Shangri-La" will continue to shine only through the process of modernization and common prosperity of Tibetans and other ethnic groups in China. The author is head of China Administration for Religious Affairs.